The trick is using the sprintf() function, which behaves largely like the C version, to insert the variable into a formatted string for use in the label command. I drive Gnuplot with shell scripts, which simplifies introducing parameters & suchlike. That’s conspicuous by its absence here, but when you need it, you need it bad. 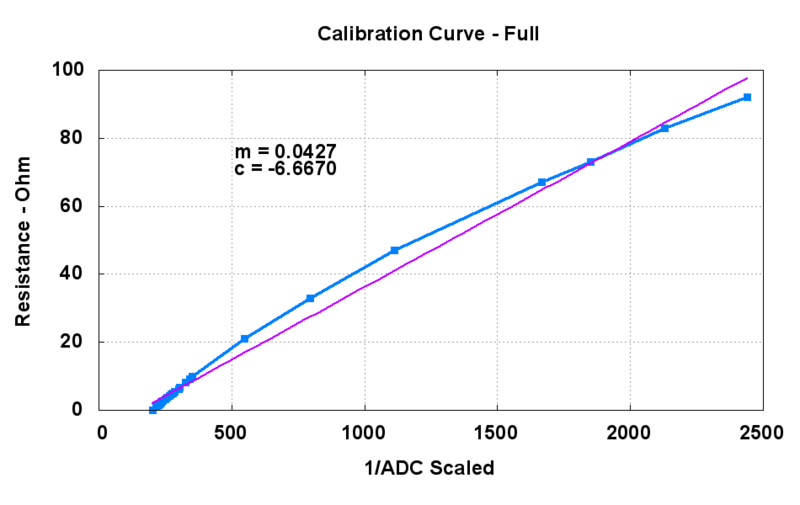 set output "Calibration Curve - Full.png"
set title "Calibration Curve - Full"
set ylabel "Resistance - Ohm"
set label 1 sprintf("m = %3.4f",m) at 510,75 font "arialbd,18"
set label 2 sprintf("c = %3.4f",c) at 510,70 font "arialbd,18"
There is no denying that a straight line is not the best fit to that dataset, but that’s not the point. This entry was posted on 2009-06-02, 20:34 and is filed under Software. You can follow any responses to this entry through RSS 2.0. Both comments and pings are currently closed. Any idea how to get the values for the fitted line? I would have thought that set table would have done the trick, but that looks like a no, go. That’s the sprintf(“c = %3.4f”,c) part of the highlighted area: you define the coefficients in the f(x) = m*x + c line, then display them as labels exactly where you want them. Not obvious, I grant you, but do-able! Thanx man!! Have been searching for this for quite a while now! :) Cheers!! It’s fairly well hidden in the doc, isn’t it? Thanks Ed, this was a huge help for me to get the fit parameters into a label.